Russell Crowe next appears on the big screen alongside Leonardo DiCaprio in the thriller Body of Lies. After that, there had been talk of the actor taking on the role of the Sheriff of Nottingham in the movie Nottingham, but that adaption has been pushed back. "I have another project based on the life of comedian Bill Hicks, which is going from treatment to draft stage with Kiwi writer Mark Staufer," Crowe said. It is understood he is considering playing the main role of Hicks — a controversial and brilliant American comedian who battled drug and alcohol abuse before dying from cancer at 32. Crowe confirmed Nottingham would not go ahead until March next year because director Sir Ridley Scott wanted the leaves on the trees in England's Sherwood Forest to be the right colour. Russell Crowe may be the best actor of our generation. He's one serious dude, but Gladiator and movies such as The Insider showcase this Aussie at the top of his game. He's also starred in A Beautiful Mind, Cinderella Man, American Gangster, Robin Hood, and 2012's Les Miserables. 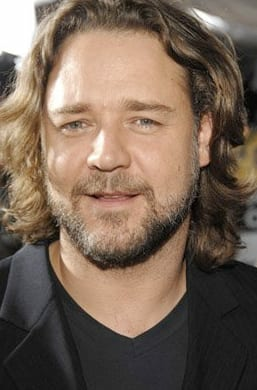 Crowe won an Academy Award for Gladiator and has been nominated other times. He's a big fan of the Toronto Maple Leafs and hails from New Zealand.